Spring showers might be great for flowers but they can be a nightmare for drivers. Wet weather wreaks havok on the roads and accidents increase with the rainfall numbers. Fortunately there are several things you can do to keep from adding to the statistics. 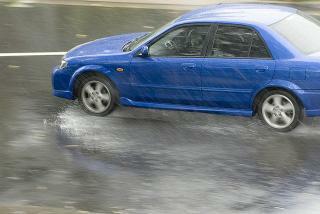 Here are 10 tips for driving in wet weather. Slow Down - Rainfall mixes with oil and grime on the roads making them much more slick, leading to skids. Slowing down keeps more of the car's tire treads on the road providing more traction, and less skidding. Driving too fast through a puddle can also cause hydroplaning. Most people forget this tip so it pays to be extra alert when driving in the rain. Check your tires - Keep tires properly inflated to the specifications listed on the door post, glove box, or fuel door. Keep your distance - You'll need two to three times more stopping distance in wet weather. Steer into a skid - If you do lose traction avoid over correcting or slamming on the brakes. Steer into the skid and slowly apply the brakes. With antilock breaks (ABS) apply firm, steady pressure, don't pump. Change your wiper blades - wiper blades typically only work well for about a year and then they break down from heat and exposure to the sun. This causes streaks and chatter and makes it difficult to see in the rain. Defrost before driving - let the windows defrost before pulling onto the road. Warm up the engine first, then turn on the defroster. If necessary crack a window or use the air conditioner to sped up the process. Use low beams in fog - high beams reflect off of the fog and actually reduce visibility. Avoid Outside Lanes - Water collects in the gutters and the sides of the road so staying more towards the center lessens the chances of hydroplaning or sending water up into the engine and causing it to stall. Wear shoes with traction - wet shoes can get slippery and having your feet slip off of the peddles while driving is dangerous. Don't try to cross flooded streets - This one should go without saying but every year there are rescues of people that tried to drive around the signs and cross a flooded road, only to have their car get stuck in the currents. It ruins the car and many municipalities will charge you for the rescue, which can be very expensive. When the rains fall just allow extra time, slow down, and get where you're going safely in one piece.